A Closer Look Reviews - Legit or Scam? A Closer Look Reviews – Legit or Scam? 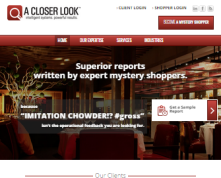 A Closer Look, found online at A-Closer-Look.com, is a marketing and mystery shopping company that gives businesses the necessary customer feedback they need to expertly improve their services and stay competitive within their industries. According to their website, this company works with businesses in the Restaurant, Hotel, Retail Store, Health & Wellness, and Professional Service provider industries to help them get a better understanding of their customer relations and services. They do this by employing “expert” mystery shoppers, who they say will provide their companies with detailed reports of their experiences as well as with suggestions for improvements or changes. Mystery shoppers are employed by A Closer Look and then given an assignment to interact with a specific client of theirs. For example, they may be told to go to a local pizzeria for dinner, with optional specifics like ordering certain menu items or “experiencing” certain issues or problems during the meal. The mystery shopper then provides a professional report on their experience, including specific details and feedback and opinions on their experience and what could be improved. It is important that this report be as clear and accurate as possible, so companies know they are receiving the most reliable information. People who are interested in becoming one of their mystery shoppers must submit a valid email address to their website and they will be emailed an application as well as be given access to their “Pre-Application Information Guidelines” which explains their company guidelines for shop assignments. Finally, you will also be asked to provide all relevant contact and demographic information and complete a “Shopper Qualifying Test.” Applicants must pass their test with a score of 7 or better in order to be eligible for hire. A Closer Look also regularly hires both schedulers for their mystery shopping experiences, and editors to look over submitted reports. Unfortunately this website does not publish payment or rate information for their employees at this time. Customers who are interested in additional similar opportunities may want to look at our related articles on Mystery Shopper Jobs and Mystery Shopper Jobs – Part 2. A Closer Look Reviews ? Average Rating for " A Closer Look Reviews " is 2.54 out of 5 based on 26 reviews. I been with ACL since 2014 I actually like some of the shops. I use to like the Blaze pizza shops but I had a bad experience with that online shop and I would prefer to do the shop at the location in any event they are always looking for shoppers to do the Blaze shops...they are just too darn picky with the timings of everything I know thats important but urgh Im not doing the Blaze shop. The pay is about a month after you do the shop atypical with other mystery shopping companies if you ask me. I like working with them never had an issue with my pay either. I was recently fired as a shopper and not reimbursed $100 because the client discredited me by saying I was intoxicated. I had great commentary on my reports and was highly praised. My profession was a quality control analyst and I have been semi retired. I was applying for an editor position because I love this line of work. First of all, the only time I have a drink is when required by a shop. In this case, I did't even touch it & drank water with my dinner. What the location reported to corporate was nothing but lies. The video showed the server handing me a cup to pour my drink into it and take it to go. The location broke their own policy and procedures. They stated they couldn't give me a cup if it was for the alcohol. I simply said ok and after my to go containers were packed up and I was ready to leave, the server brought me a cup. I assumed she got permission and it was ok. They stated I was intoxicated and was bragging about it throughout the evening and I took the drink anyway after they said I couldn't when they were questioned. This was a big high end establishment and I'm sure pay ACL a nice fee. The client has the power to fire you as a shopper for any reason they choose and ACL is loyal to them not the mystery shopper. Didn't they think about why she brought the cup anyway? Did they review my previous shops to see there were no issues like that. People who are intoxicated tend to do the same thing over & over. There was no consistent issue or previous complaint. It was totally my word against theirs. I was applying for an editor position and they lost a perfectly great shopper for doing exactly what needed to be done. Helping the clients improve matters to prevent issues. In this case could be when a customer wants a cup you fill it with a fresh non alcoholic beverage to go. No empty cups to the table if the policy is you can not remove alcohol from the premises. The answer is not to fire the individual who is helping you find the employees breaking the rules. I wouldn't want to work for a company who doesn't have your back like that corporation obviously had their employees back! They also should include in the guidelines not to remove alcohol from the premises. I just received a check as well for $2400.00 with instructions as well. NO, it is a scam. The bank will deposit the check, but a few days later when they find out it is fake they will take it out of your acct. The scammer is hoping you will go buy the products they want before you find out. They wanted me to buy $2500 worth of iTunes cards. They wanted pics of the scratched off code and amount sent to them. Then they sell the gift cards for $70 - 80 online. They pocket all the money and you have spent your money. If it's really a closer look, they dont pay you until after the assignment. Shred, burn, destroy the check, and count your blessings you saved money and time! Did any any thing bad happen, what did you do? Brand, 36, of Ladson, S.C., filled out a questionnaire to become a secret shopper and received a check and a letter in the mail for nearly $3,000. He was suspicious about the check, but went online to look up the company, A Closer Look. He says after reading through the website and seeing they had been around for 15 years, he decided it was legit. Brand took the cashier's check to the bank, then called the toll-free number on the letter to get his assignment. He talked to an operator who told him to spend a small portion of the money at a Walmart and to wire the rest to England. He was told they were testing their international rates, so he didn't think twice about sending the money out of the country. Two days later at lunch with his daughter, Brand's credit card was declined and he found that he owed $2,711 to the bank. Sensing a scam, he called a number he found on the Closer Look website. He was told the company had recently learned a scam was being run using the company's name. It is typical for crooks in these types of schemes to use the reputation of a real company to convince people to fall for the scam. Though he's notified the FBI and the FTC, Brand is responsible for paying back the money he lost in the scam. "What I'm being told now is the paper wasn't good and with the watermark, it should've been caught. The check was cashed at the (bank) and if they can't tell it's fake, how am I supposed to be able to tell?" says Brand. Attorneys general are warning people to beware of secret shopper checks and money orders received through the mail. The scam takes many forms, but usually, the consumer is hired to evaluate a wire transfer company as Brand was. Victims receive a money order or checkto deposit into a personal bank account, which they then are told to wire out of the country. The check or money order, which could be for thousands of dollars, is worthless -- something that might not become apparent for a week or more. But when the check is found fraudulent, the consumer is responsible to the bank to pay back the amount that they withdrew. In Nebraska, officials said scammers have used actual U.S. Postal Service money orders that have been doctored from their original $50 purchase to appear to have a higher value, such as $950. The code on the money order reveals the true amount. The U.S. Postal Service will check any money order for fraud. Once the money is sent overseas getting any back is pretty much a lost cause. "We refer most of these fake check scams to the Secret Service for investigating and unfortunately it is impossible to recover any money lost in this scam because the perpetrators are untraceable and are often located overseas," Molly Butters, spokeswoman for Indiana Attorney General Greg Zoeller told Consumer Ally. "Bottom line: Don't wire money anywhere for any reason if you are solicited by a stranger." Charge a fee to be a mystery shopper. I got a check in the mail yesterday but I can't get it cashed cause nobody will cash it. They think that it's a scam and want to know what the check is for but it's supposed to be confidential. I don't know what I'm supposed to do because I can't get the check cashed to start any of my assignment. This is what i would do, first place it in a separate account, then wait for 30 days, if it clears then don't do anything, just wait. if it is not reported stolen then contact the company or bank it was drawn on. ask if some one there drafted a check in your name for said amount, if they say they didn't then call your bank and let them know, they will take care of it, this is just so you don't get your Account charged for some one using a check to scam you. never assume the check will clear, because chances are you don't have that kind of money in your account in the first place, so don't cash it from your account because it is YOUR MONEY you are sending. I got the exact thing and amount as you? Is it legit? I just got the same thing in the mail today 10/01/18. What have you heard? Both sister and brother say ti's a scam. Do not cash those checks they are bot from closer look. A real comonay is not going to send you a check and ask you to go shopping. Youhave to work first then get paid. there are a lot of websites that pretend to be secrey shopping websites and use fake emails and look very real but they are not real. A Closer Look is a legit secret shopper company who always pays on time (abeit a bit slowly). It takes approximately 45 days to get your check. If you live in a larger city, there are probably great shops available. In my small (55,000) city, there is only one restaurant owner who uses them so you end up doing the same places over and over. Sign up and use it when you travel. You get reimbursed for a meal. I use it to take my friends to a nice lunch for free. If you do dinner shops, you must have cocktails and sometimes you barely break even. But you still get a night out for nearly nothing. Sometimes the editors are a little nit-picky but in 5 years, I have never had a shop rejected. If you miss something, be honest. I got to do a shop on a local assisted living facility, took some photos, wrote a report, and got $75. I imagine it would be tough if you were doing it for a living, but for me, it's a hobby job. I like it. Horrible company to work for. They treat their "independent contractors" like employees which is VERY ILLEGAL. They provide very low pay for an unreasonably hefty workload. They're unorganized and you're micromanaged by uneducated, stay-at-home women who go on power trips and punish you for any little mistake you make. And you make less than minimum wage working full time as either a scheduler or mystery shopper! Dreadful company. When did you work for them? Did you ever seek legal advice on being incorrectly labeled as an independent contractor instead of an employee?